Don't forget the little ones! When you planning your school festival, church carnival or birthday party sometimes it's easy to overlook the smallest of your guests. In the rough and tumble bounce world, it's always a good idea to have a space where the toddlers have their own play area that is separate from the big kids. 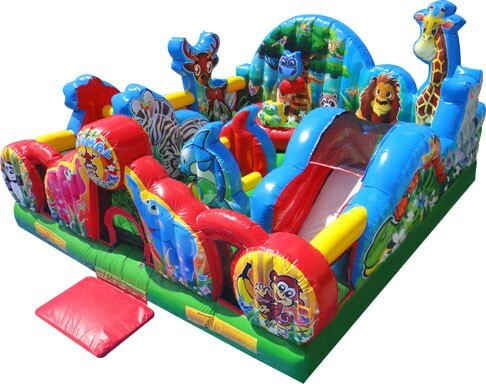 These toddler rentals provide our customers with inflatable bounce houses specifically designed for toddlers. Bright and colorful, these toddler-friendly inflatables have built-in safety features parents will love. Browse the inflatable toddler playground rentals below and click on the title or image for more information. Our inflatable Animal Kingdom is perfect for the little ones. Inside the bounce house you will find deer, lions, zebras, giraffes, dolphins, pandas, monkey’s elephants and lots of moonwalk fun! Chugga Chugaa Choo Choo all Aboard! 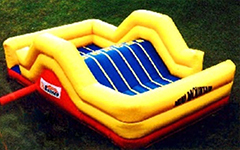 This inflatable obstacle course begins with a front loading obstacle entrance, taking you through tunnels and pop-ups to facilitate maneuvering skills. The obstacle then leads to an exciting climb and slides. 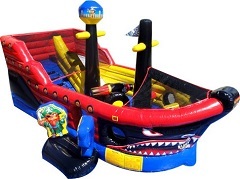 The Lil Pirates bounce house will have them plundering on the high seas in no time, in this amazing realistic inflatable pirate ship. A pair of buccaneers greets each player at the ship's entrance, and inside kids can bounce in the ample jumping area, battle through the pop-up obstacles or enjoy the climb and slide located at the stern. The bounce house boasts impressive three-dimensional artwork, with a traditional pirate skull and crossed swords at the bow and ship's flag, along with a lookout on the mast. The ship itself has a life of its own, with a sharp-toothed face on the outside bow, the Lil Pirates bounce house is sure to please any landlubber! 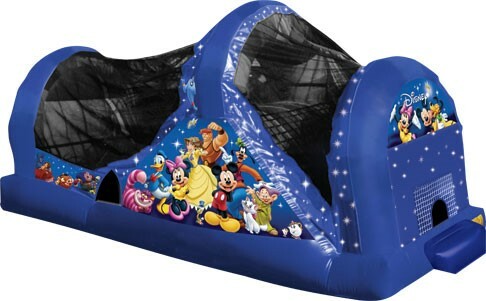 World of Disney Backyard slide brings magic and fairy dust to your next get together. The ensemble of Disney stars takes their places on the fantastic art panels, including Tarzan, Cruella, Pooh and the gang, Lilo and Stitch, Pocahontas and more. Ariel and Genie make appearances on the archway, and Mickey and Minnie can are waving goodbye at the back end of this adorable wet/dry slide. Kids can choose from three activities including a jump area, or a dual-lane climb and slide for hours of fun under the stars of Disney. High-visibility mesh around all sides allows parents and spectators to view the delightful play.